Destrat Fans – You cannot beat the laws of physics that warm air rises and this process causes thermal stratification, a natural process which causes warm air to rise to the ceiling or roof space and displaces the cooler air, pushing it downwards into the occupied area. 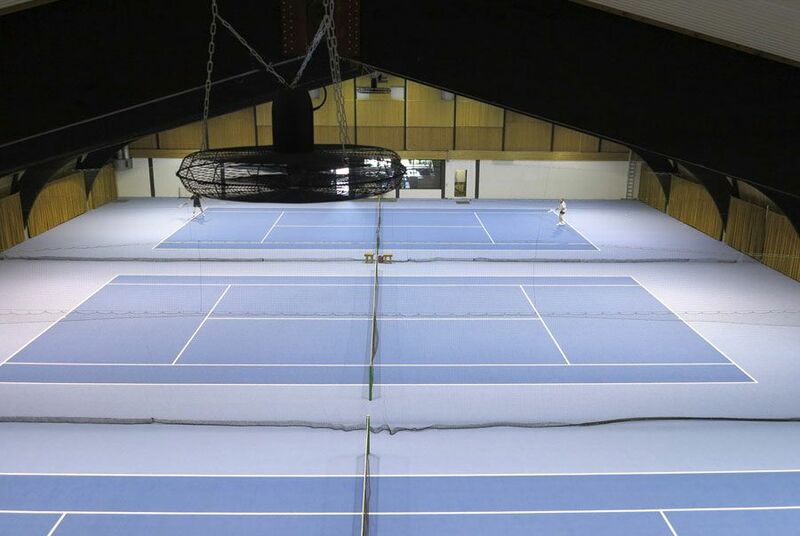 With any conventional air heating system, air will rise to the roof level by natural convection in high building such as factories, warehouses and sports centres. This can result in high temperature gradients and consequently increased energy usage. 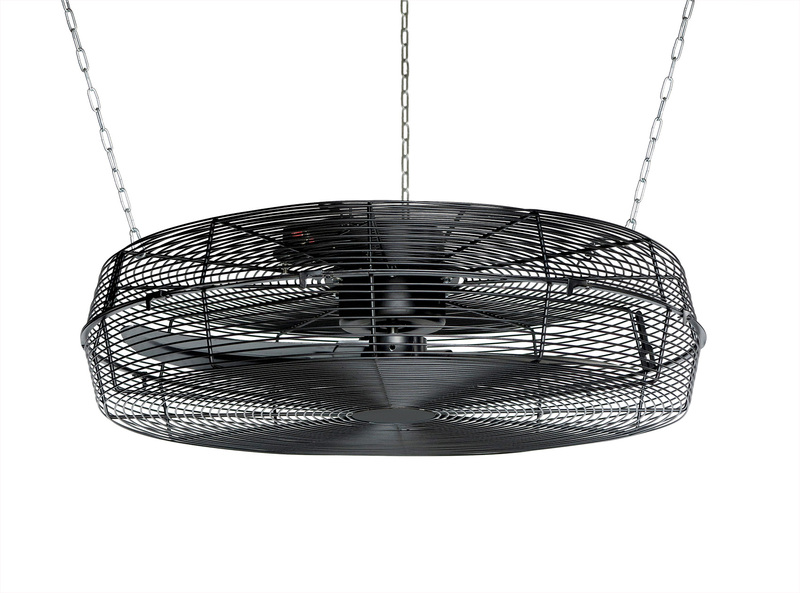 The Carbon Trust estimates that the use of destratification fans in industrial buildings with high ceilings can reduce the consumption by up to 20%, although some other studies show that this may figure may be up to 32%. These Destrat Fans are basically a heat recovery unit which benefit from low running costs and little to no maintenance requirement. Which low velocity destratification fan model do I require and how many do I need ? the fan selection depends upon the height and area of the building. *Please note the ‘mounting height` refers to the distance between the blades and the floor. 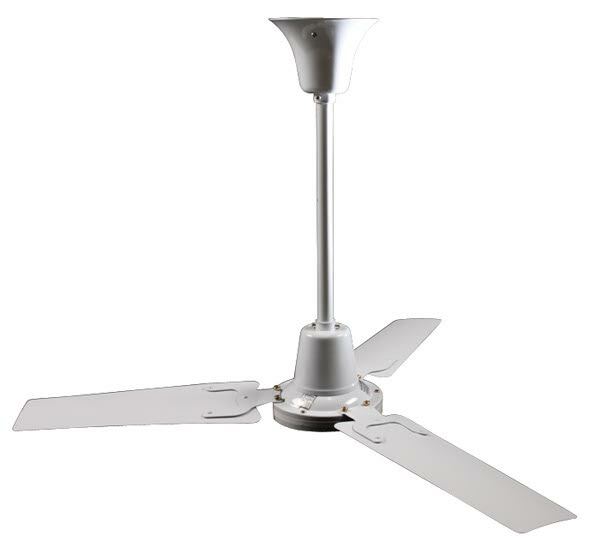 There must be a minimum distance of 2.3m between the floor and the lowest point of the fan. As this resulting figure is over 4, you would require 5 fans for this area. Consider the mounting height first as this will dictate which type of destratification fan you require. Then calculate the volume of the building and multiply by two to determine the amount of air that needs to be re-circulated for effective destratification. Divide by the primary air flow of the unit to determine the number of units required. As you can see in the above before picture, the ceiling is hot and the floor area is cold due to the warm air rising. 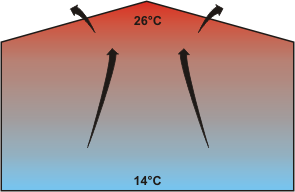 To get the required temperature at floor level you have to heat up repeatedly, even though the ceiling area is already 26°C. 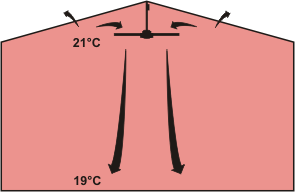 The high temperature of the ceiling causes a corresponding high energy loss at the ceiling. Often some areas of the room stay cold after prolonged heating. 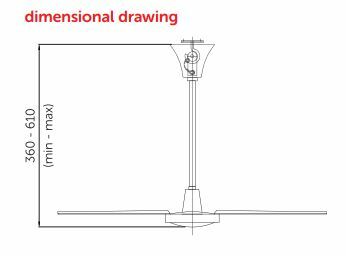 These low velocity destratification fans are supplied with 2 downrod lengths- A 400mm downrod fitted giving a 610mm overall drop (from ceiling to base of motor body) and a 150mm downrod (supplied loose) giving a 360mm overall drop (from ceiling to base of motor body) *** we highly recommend using the 400mm downrod. 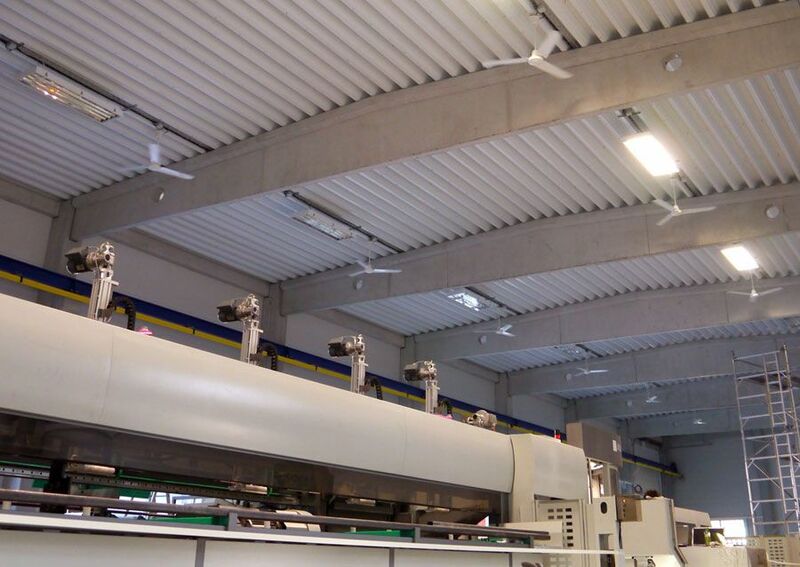 We have a great range of destrat fans to suit all commercial and industrial destratification needs, all are the best quality , and at the best prices. 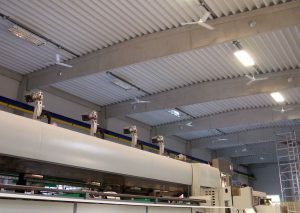 These destrat fans will automatically recirculate the high level warm or hot air from high level , to ground level, thus reducing stratification and any associated heat losses.This movement of the warm air from the ceiling or roof, down to the floor level, not only converts potentially wasted heat or energy back into useful heat, but can also lead to reduced energy bills, as they can save up to 32% depending on the height of the building, warehouse, factory or church .If you require any further assistance with any of our Destratification Fans – Destrat Fan – Industrial Ceiling Fans, please click here to contact us via email or call us direct on 01202 822221.